DU YUN at Miller Theater (Nov. 15, 8 p.m.). Following quickly from Kate Soper’s composer portrait, the Miller now looks at another leading force on the New York scene, Du Yun, whose “Angel’s Bone” (an “appallingly good work,” as my colleague Corinna da Fonseca-Wollheim put it) happened to win the 2017 Pulitzer Prize for which Soper was a finalist. The International Contemporary Ensemble is on hand to play music that overflows, often raucously, with ideas. 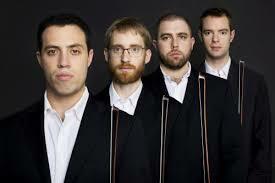 JACK QUARTET at the 92nd Street Y (Nov. 9, 9 p.m.). A later-night session from the nation’s most important quartet includes Andreia Pinto Correia’s String Quartet No. 1 (“Unvanquished Space”), Sabrina Schroeder’s “Slip Trains,” Zosha Di Castri’s String Quartet No. 1 and Ligeti’s String Quartet No. 2.